On Wednesday 18- November Bogota Beautiful had their monthly board meeting. At the start of the meeting Chairperson Amaru Bustamante took a moment to thank outgoing Councilman Robert Robbins for his service as first Council Liaison in the organization's history. Councilman Robbins congratulated them on their work and agreed to continue as an active member. 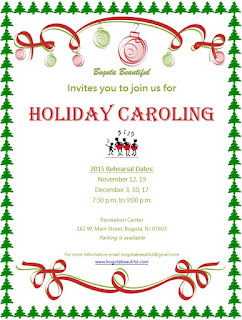 Some of the announcement made at this meeting were that the Holiday Carolers will again perform at the Brightside Nursing Manor in Teaneck, on Saturday 19- December. They also have started open rehearsals for anyone wishes to join. 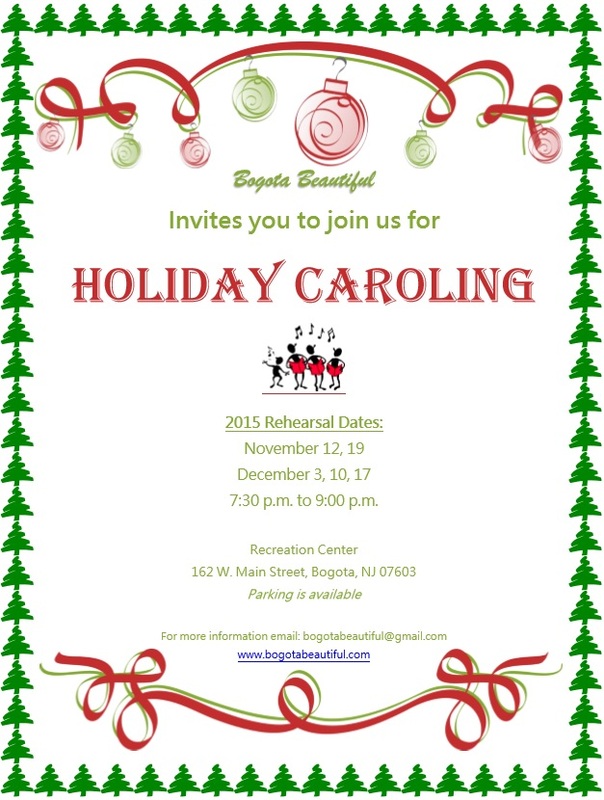 They will also sing at the Borough Tree Lighting on Friday 11-December and are again accepting reservation to sing at private resident, of group function in Bogota for the Holiday season. Members of the Schiller Institute Bogota Community Chorus were in attendance, and inquired about joint performances. Bogota Beautiful has set Saturday 23- April -2016 as the date from their second annual Earth Day clean-up of Bogota. They will again do a trash removable, weeding, and general lawn care of Olsen Park, along with sidewalk cleaning of the W. Main Street business district. They hope to include the Ft. Lee Rd railroad crossing with this year's clean-up. They had over 130 Volunteers at their first clean-up and hope to double that number in 2016. Anyone, or groups wishing to volunteer workers, materials, or give financial donations are encouraged to contact them as some as possible. Working on the success of their Summer Yoga program, they will host Winter Salsa night in January. These are be tentatively be be every Thursday ( 7, 12,21,& 28) of January. These will be lead by Isabel Bustamante who will teach anyone in attendance the art of Salsa Dancing. This will be open to all ages and experiences in dancing. They plan a final night dance party on 28-January. For their " Bogota Community Garden" project they have obtained six rain barrels to be use in the Garden. They are looking for Volunteers to assisting in priming them for painting, and transporting them to the High School where they will be decorated by the High School Art Club Students.